The Water Warriors Colossus appears to be the largest blaster of the new models released for 2012 by Buzz Bee Toys Inc. 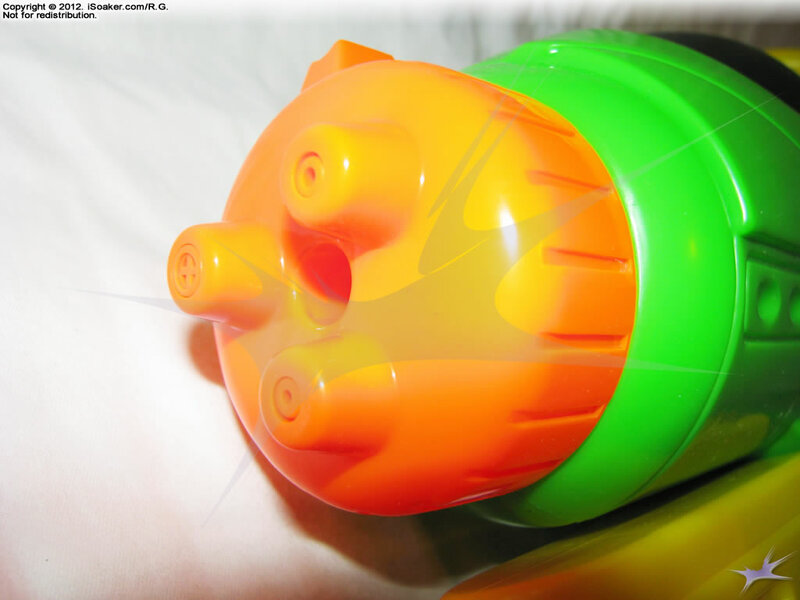 It features a separate air pressure chamber and a nozzle selector with 3 nozzle settings (2 stream and one riot-blast). 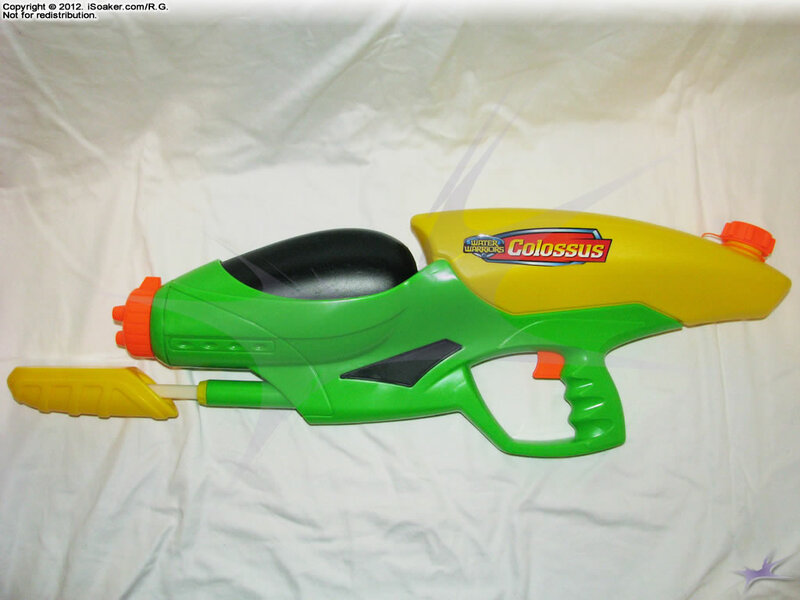 Styling is reminiscent of older blasters like the Water Warriors Hydra and Water Warriors Titan, but the Water Warriors Colossus features a large and uniquely shaped single pressure chamber on its front comparable in size to the twin-pressure-chamber volume of the Water Warriors Gorgon. As well, it sport an improved trigger grip with finger indents and better designed nozzle selector options. Like the Water Warriors Python, the Water Warriors Colossus features a nozzle selector with three settings: two stream settings and one burst setting. The nozzle selector is nicely designed with an extended tab that ends up in the vertical position when the optimal stream setting is selected. Again, like the Water Warriors Python, twisting to the right gets to the water saving setting while twisting to the left gets to the burst setting. Being a separate pressure chamber, for best performance, one should pre-pump in air into the pressure chamber before pumping in water. Pre-charging the pressure chamber can be done prior to filling the reservoir or by holding the blaster upside-down when pumping so that water is not drawn in. Output from the stream settings are a little higher than that of the Water Warriors Python, making them respectable, but still not exceptional. However, thanks to the large pressure chamber size, shot times on the Water Warriors Colossus are quite good. The burst setting, like on the Water Warriors Python,, is akin to a larger opening, but with X-shaped dividing plastic bars crossing the opening. The resulting blast is not an uncontrolled spray, rather the burst setting results in four thin streams pushed out nearly parallel to each other. Streams diverge slightly, meaning the blast will cover more area upon impact than the large, single stream. However, since the burst setting still produces streams, range on this setting should be much better than "flood"-type blasts, fans, or shower nozzle settings while providing a functional difference than simply being a larger stream. Interestingly, the burst setting on the Water Warriors Colossus appears to push out more water than its largest stream setting, making it more of a burst than the one found on the Water Warriors Python. Having a separate pressure chamber, the pump on the Water Warriors Colossus pushes a typical amount of water per full stroke. Pumping, itself, is smooth on its forward-mounted pump. Like the Water Warriors Viper, its pump rod is square in cross-section and does not rotate freely. This gives the pump a solid feel, though some may have preferred a freely-rotatable grip. However, by restricting rotating, this prevents the pump grip from unintentionally hitting the base of the forward section of the blaster. Unfortunately, due to the shape of the reservoir, the reservoir's cap ends up often below the water line, resulting in some burbling noises as air enters the reservoir through the cap to replace the water being pumped out. The sound produced is probably not too noticeable if outside, but as testing was done indoors, the pumping sounds were more audible. The trigger and grip area of the Water Warriors Colossus is a notable improvement over previous Water Warriors water blaster models. The use of finger groves improves the feel and stability of the grip, even when wet. However, akin to the Water Warriors Python, the upper-most indent for one's middle finger is on the close-side to the base of the trigger. While the trigger, itself, features a flattened bottom, it would be better had there been a little extra space/rounded plastic between the trigger and the middle-finger indent. The trigger/grip area is also bordered along the bottom by a plastic divider. Though the space provided is quite reasonable, those with larger hands may find the added piece of plastic restrictive. The Water Warriors Colossus holds a decent amount of water in its reservoir, though it does feel like a little more space could have been used for reservoir volume. Nevertheless, a full resevoir allows a user to completely refill the pressure chamber over three times. Additionally, since the reservoir is not pressurized, one can fill, pressurize the pressure chamber, then top off the reservoir to maximize one's water capacity in the field. In the end, the Water Warriors Colossus is a good, solid addition to the Water Warriors line. 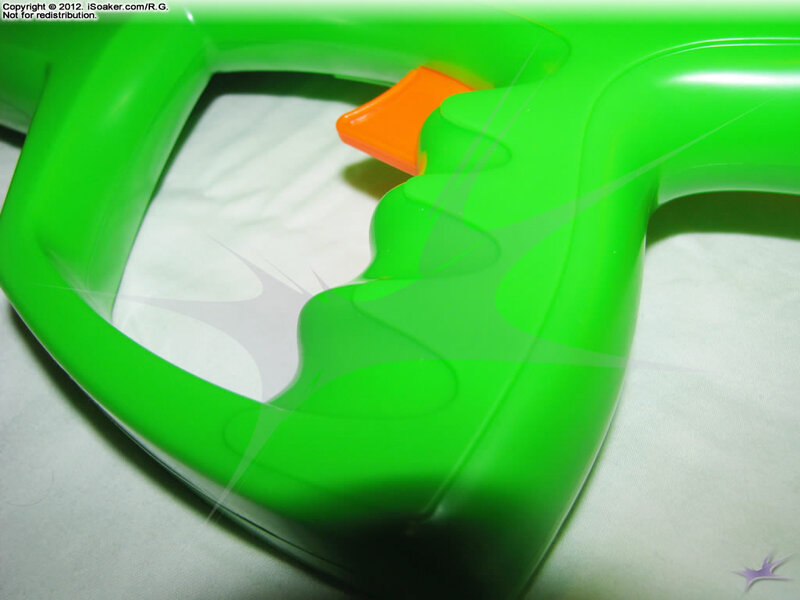 Featuring familiar overall styling with improvements in key areas, this blaster shows a positive trend in stock water blaster evolution for water blasters produced by Buzz Bee Toys Inc.. Sporting the largest single air-pressure chamber of any Water Warriors water blaster, the Water Warriors Colossus performs well and should make for a good addition to most armouries. Able to hold its ground against any other modern water blaster, just be wary when going up against the largest of the pressurized blasters. Nice styling, sturdy build, multiple nozzle selector with distinct and useful nozzle settings. Large separate pressure chamber offers long shot times. Respectable power, capacity, and performance for a blaster of this size. Some may wish for an even larger nozzle setting than those provided by the nozzle selector. Pressure chamber should be pre-pressurized for best performance. 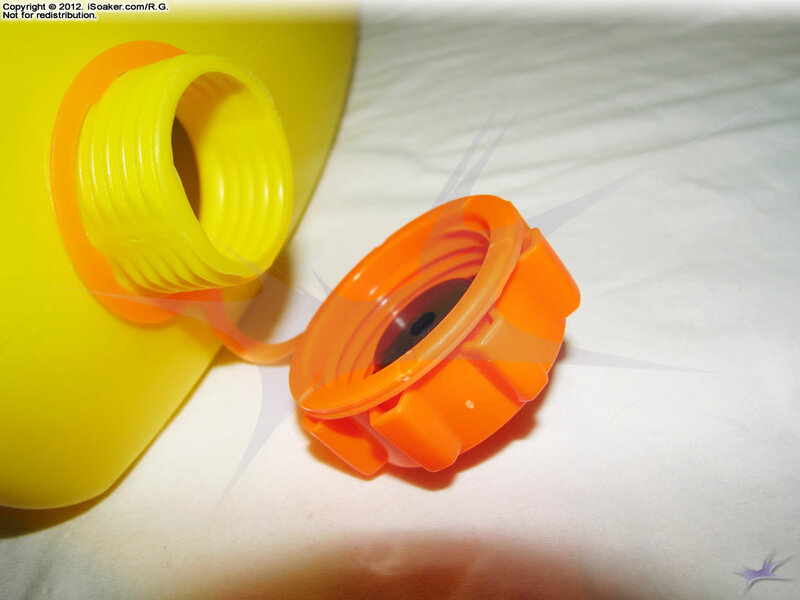 Grip area confined by a plastic piece along the base of the water blaster; while decently sized, may be restrictive to those with larger hands.